The original trading card art. All art owned by Marvel. Back in 1993, both Marvel and DC built their Annual around a gimmick of new characters. While DC used this to give us the Bloodlines crossover, Marvel stopped crossing over their annuals for the first time in years to let each book tell its own tale. Most of the characters introduced were not destined for greatness (see the Battling Bantam and Khaos, literally someone's over-powered D&D character), while a few had decent lifespans as characters (Genis-Vell then known as Legacy, Adam-X the X-Treme.) But one character I really liked and thought had a lot of potential went literally nowhere. Tamika Bowden was a promising gymnast with a huge future ahead of her. But her engineer father refused to work for New York mobster Big John Buscelli. The crime boss arranged for an "accident" that would cost Tamika the use of her legs. Dennis Bowden would throw himself into helping his injured daughter. He created an exoskeleton that when activated increased her strength, speed and agility beyond human levels. 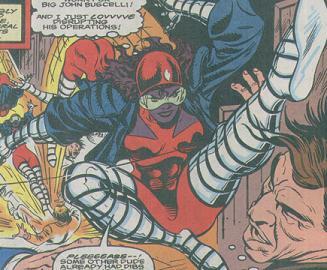 Coupled with the skills she learned before her injury, she took to helping others as the vigilante Wildstreak. Herb Trimpe wasn't afraid to go maximum Liefeld. It's a solid basic street level vigilante origin, right? The thing is, it came in the middle of Fantastic Four Annual 26. Written by Tom DeFalco and drawn by Herb Trimpe in his 90s style, things come to a head when she traces Big John's money to Florida. There the mobster had his own problems with a symbiotic monster known as Dreadface. 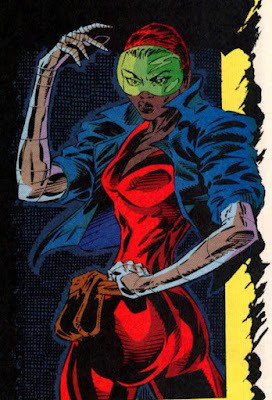 Wildstreak barely escaped her first encounter with the villain, all thanks to the intervention of the then-masked Thing. Alongside Ben Grimm and Psi-Lord (the fully grown Franklin Richards from the future), she fought back Dreadface and saved the day. She would make one other appearance, nearly a year later, in the pages of DeFalco's Thunderstrike (another criminally under-rated title.) She teamed with the title hero to face down a gunrunner that was also her former classmate. Her exoskeleton's batteries ran low as the gunrunner recognized her. Only the appearance of the murderous Sangre saved her identity from being exposed. Keith Pollard's Wildstreak in action! Wildstreak wouldn't surface for over a decade, again in the pages of Fantastic Four. As a captured rogue hero during "Civil War" she's used by Mister Fantastic to test out a prototype cell. But Invisible Woman uses her own abilities to help free Wildstreak and cause her to break free. Why a character whose powers are all technologically based even needed a special cell, I cannot explain. Nor do I suspect J. Michael Straczynski and Mike McKone did the research to explain why such an appearance made little sense. 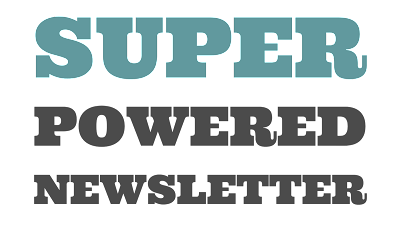 After her escape, Tamika disappeared from comics forever. Or at least for over another ten years. 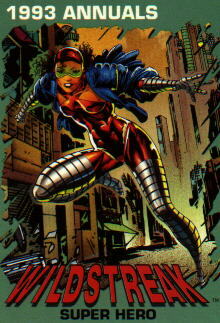 Like so many creations of the 90s, it feels like Wildstreak gets shorted because of her origins in an insanely drawn special event annual complete with trading card. 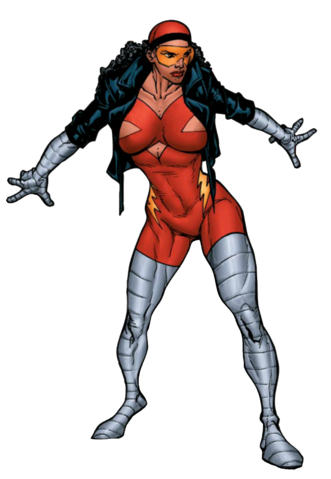 But at her core, she's a solid character with an interesting background and a power set designed for high energy comic stories. I was taken enough to throw her into a Hawkeye series pitch I designed many years ago. Though most of the story is lost to the sands of time, it revolved around Hawkeye coming to terms with his independence from various super-teams, even as he started a new relationship with Wildstreak as crime-fighting partners. was a mess, but he drew the heck out of her costume. Look, even now, Marvel has a severe lack of strong female and strong black characters (though it does better than DC at the second at least.) Wildstreak fits both those bills and has a fun simple design as well. She's a character waiting for someone to dust off and bring to the forefront. But until then, she'll just be that obscure character with appearances I can count on one hand.